NAICS 445310: This industry comprises establishments primarily engaged in retailing packaged alcoholic beverages, such as ale, beer, wine, and liquor. The ROI's Quick Reference "Cheat Sheet"
Tests for solvency or ability to meet current debt obligations. Measures how well you can cover current liabilities with liquid assets. Tests the degree of solvency most strictly, using only the most liquid current assets. Compares what the company "owes" creditors to what it "owns." Measures the financial strength of the business. COGS are recorded on your income statement; Inventory is found on your balance sheet. Measures how often, at present rate of sales, your entire inventory is completely sold and replaced during a given year. Measures inventory "velocity." Indicates percentage of sales dollars remaining after costs related to purchasing merchandise are recognized. Indicates percentage of sales dollars remaining after all costs (except taxes) are recognized. Indicates pretax return on assets; measures productivity of assets. Inventory @ Cost - your balance sheet. ©Copyright, The Retail Owners Institute® • www.RetailOwner.com • All rights reserved. 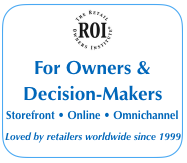 Get answers at The ROI's Retail Benchmarks Resource Center. Free to everyone to use. See the how-to article: Go Figure! How to Calculate Your Key Ratios - in 12 Seconds Each! Very quickly, you can see how and why to monitor the true "vital signs" of your business. "How and when can these benchmark numbers be used?" • Calculate these ratios for your own business, and then see how you compare to your retail industry segment. • Use these benchmarks when you are setting your own target ratios for the next year. • Seeking a bank loan for your business? The bankers will look at these industry benchmarks as they assess your store's performance. • The credit departments of your vendors and landlords will examine your ratios to assess your credit worthiness. • Use The ROI's Key RATIOS Calculator to quickly calculate your own ratios. The ROI has selected six key ratios (from the abundance of ratios available) that are particularly important for retailers to regularly monitor and manage. See The ROI's Benchmarks Resource Center to learn more about these key ratios for retailers. Remember, there also is a Top Quartile – and Bottom Quartile – of results for every segment. See your local library for those details.